Invite your family, hoping that this is the year certain well meaning but clueless relatives won't say things like "He'll grow out of it!" and "Is he ____-ing yet?" and "Isn't there medication for that?" and "I think he just needs more discipline." Swoon when your child comes home from school with a handprint turkey and a note that he is thankful for everything Mommy does for him, even if his teacher wrote that. Maybe he can't speak it or write it, but you know he feels it. Wonder if this is the year your child will sit at the table. On the big day, charge up the iPad, tablet, all available phones and any other device in your house to entice your child to sit at the table. Wonder if this is the year your child will eat the Thanksgiving meal. Make sure you have pizza bagels/ramen noodles/Froot Loops/whatever food your child is into because: reality. As family arrives, watch your child have a meltdown thereby encouraging certain relatives to think he hasn't changed a bit since last year. Vow to not let child use the iPad/tablet/watch TV before dinner starts. Give up five minutes later and let child use the iPad/tablet/watch TV. Feel a little wistful when you see the other kids doing their typical kid things. Encourage them to say hi to your child. When one of them tries to swipe your child's iPad/tablet, try not to hiss at her. Entice child to table with iCrack device plus Froot Loops/pizza bagels/ramen noodles/whatever. As a relative says, "Why's the table vibrating?" exchange smirks with your spouse and place a hand on child's knees so he stops rhythmically kicking the table. Make a big show of letting child know how incredibly yummy the turkey, sweet potatoes, stuffing, mashed potatoes and green beans are! When child says something and relatives ask what he said, translate for them: "He said 'Yuck!'" Give child more ramen noodles/Froot Loops/pizza bagels/whatever. Then give some to sibling, who isn't much into Thanksgiving food, either. Allow child to play with cranberry mold, should he desire, because it's a sensory activity and at least the cranberry mold your aunt brought will be good for something. Feel grateful when relatives who don't see your child that often point out how much progress he's made. When child eventually dashes away from table, let him hang out in another room and console yourself by eating your body weight in stuffing. Bring it, comfort food! Alternate enjoying conversation with family with checking on child. When one of those well meaning but clueless relatives asks about child's diagnosis, say the following: "Things are proceeding! How about some more sweet potato pie?" If relative persists, shoot your spouse A Look so he'll save you. Take a bathroom break so you can hide in there and calm your nerves. Decide that today is not the day you are going to worry about whether too much iPad/tablet/TV time is bad for your child's brain. Bring pie to your child on the off chance he might want some. Cuddle with him on couch and eat it yourself. When relatives leave, child is finally asleep and spouse is cleaning up, sit at kitchen table in a stupor and feel thankful you made it through. Then down a cold pizza bagel/more stuffing/whatever. Kathryn, wishing you a speedy recovery and a good Thanksgiving with your family. Max will gladly eat extra pie for you! This is very depressing and sounds like you are dreading the holidays. I'm sure having a house full of people combined with Max's needs is incredibly challenging and undoubtedly stressful, but what about your other kids? Seeing your family? Enjoying having everyone together? I wish you all the best and truly hope your day tomorrow is better than you anticipate, especially since it's Ben's first Thanksgiving. 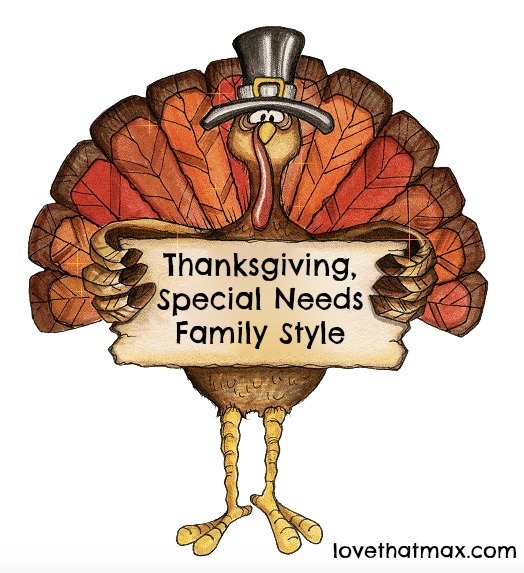 This is most understandable, and relatable, if you have a kid with special needs. Holidays can be really challenging, no matter what blessings you have. Keeping your sense of humor helps! I meant no disrespect, Ellen, nor did I want it to seem like I was trivializing the challenges you face. And I think we can ALL relate to having to deal with insensitive, clueless relatives! Hope you have joyous holiday. Just curious, does your family read your blog? If I read a post like this from one of my relatives and knew I was going to their house for Thanksgiving the next day, not going to lie, I would feel a little uncomfortable. Or perhaps it would give you pause if you are one of those people who say well meaning yet clueless things. This sounds like me. Every time we need to get together with family. Oh, I had fun with this! I read it to my brother, and we re-wrote it to fit our family. A few examples -- is the year certain well meaning but clueless relatives won't say things like "Aren't you ever going to get married?" and "Are you dating yet?" and after many discussions about various ailments (you must be 70+ to participate in this discussion) "Isn't there medication for that?" Wonder if this is the year cousin Rachel will eat the Thanksgiving meal, because well, you know, she doesn't eat things that arent organic and preservative free and non-gmo and didn't touch anything that was. Make sure you have organic non-gmo preservative free pizza bagels/ramen noodles/Fruit Loops/whatever food she's into because: reality. This is our family every time theres a holiday spent at the inlaws. (Or any day actually) They just don't quite "get" autism yet. Despite my explanationson , they keep expecting a "normal " kid? I have a feeling that the person that posted questioning your blog entry has no special needs person in their life. It is easy to misunderstand the nuances of your post. I don't like pumpkin or apple pie, so I just eat a lot of ice cream.